Raw honey is by far and wide one of the most revered foods and healing substances found on this planet. There is no substitute, and the delicately sweet flavor it possesses is unsurpassed and unmistakable. Delectable already, why would one ever dream of altering it? Honey lends itself well to infusions, and the end result is a quite special little concoction that you can bottle up and save for celebrations, or give away for special occasions. I recently started an herbal infused honey of lavender and vanilla bean for a Christmas gift, and in fact, I’ve started a lot of different infusions for gifts lately, but hey, that’s a whole other blog post, (and a half-written one at that). Honey and high heat do not get along very well. It has been found that excessive heat can have detrimental effects on the nutritional value of honey. Heating up to 37 °C (98.6 °F) causes loss of nearly 200 components, some of which are antibacterial. Heating up to 40 °C (104 °F) destroys invertase, an important enzyme. At 50 °C (122 °F), the honey sugars caramelize and it turns from a light color to an increasingly darker color as the temperature rises. 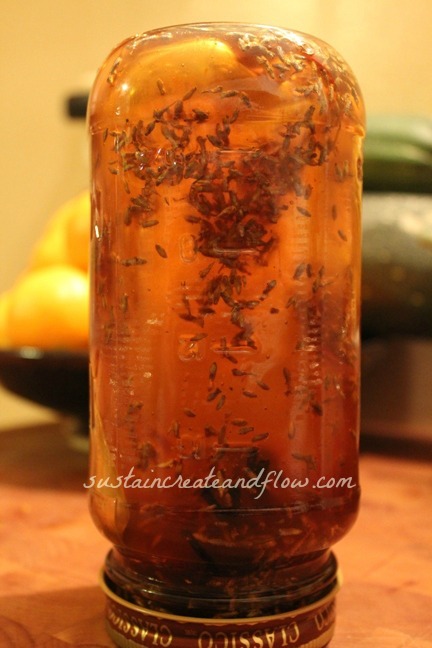 Infuse honey naturally by adding 2 Tbs. of dried herbs or a few split vanilla beans (or whatever you fancy) to a cup of honey. Leave it out somewhere where you will see it and remember to turn it over everyday. It’s just like infusing an oil or vinegar. Let it infuse for a few weeks, tasting from time to time to see if the desired flavor has been achieved. (I prefer 4-6, but even 2 would get you by). When the time comes, you may strain out the herbs if you’d like or leave them in. I use a mesh strainer over a mason jar and it works great. Straining may take a while and allow gravity to do the work. Place your honey in the warmest room of your house for better flow. If you are still struggling, (like it’s the onset of winter in Canada and there are no warm rooms in your house), heat your honey gently, by placing your glass jar in a bowl of warm water. Use caution, and a thermometer if you are concerned about preserving the benefits of the raw honey. I would not recommend going over 95 degrees F.
Simply combine powdered herbs or spices into your raw honey and you’re done 🙂 There’s no straining or fussing. Only stirring. There is a chance you will see the powdered herbs in the honey, but since raw honey isn’t crystal clear anyhow, it shouldn’t matter, right? In this method, the herbs stay in for an added herbal boost. —Mountain Rose Herbs is a great resource for all things herbal. They’ve got a great selection of dried and powdered herbs. 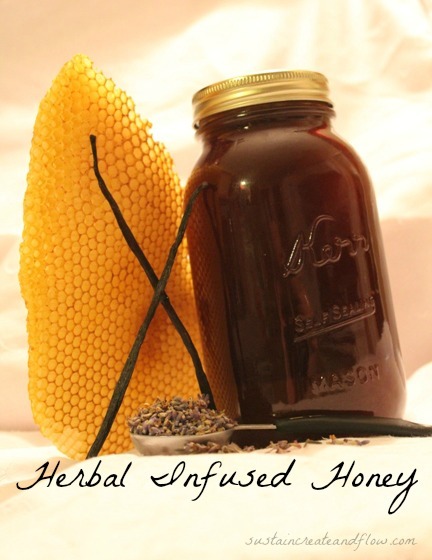 **Want to see another great honey recipe of mine? Follow this link for a recipe you can make for your family to help cure what ails ye. This is my FAVORITE POST YET! I can’t wait to try this some far off day when I have more honey and more time! HONEY SHOULD NEVER BE HEATED AT ALL. I have myself seen this poisonous effect on one of my relatives who used to take honey in hot fluids. this affected him badly. when he went to the doctor, and after months of diagnosis, he was diagnosed with the accumulation of a glue like substance in his body, and very late it was discovered that this was due to the heated honey. the heating of honey changes the molecular structure of the honey and makes it highly toxic. it should be made compulsory by all the legislations in the world to mark on the bottles that honey should not be heated. also, it is a shame that too many companies these days are marketing their cereals with honey, whose preparation involves heating the cereals to cook them. the right procedure is only to cook the cerals, then make them luke warm and thereafter only add honey. these companies who are marketing so many sorts of “processed foods” as “healthy choices for people” should be banned by people, as no government around the world have hands big enough to ban these big and powerful brands. this has been scientifically proven that when honey is heated, it forms a chemical called as hydroxymethyl furfuraldehyde (HMF) and also chemically alters its basic structure/ composition while increasing peroxides. So it shouldn’t be put in hot tea? Oh I love this idea! I think years ago while visiting a lavender farm I bought a tub of lavender honey which I guess would have just been lavender pieces mixed into the honey, yet it seemed so fancy and unique at the time! I can so easily now make it myself! tried mixing ground cinnamon with buckwheat honey …….just kind of stayed on top kind of dry and crusty what did i do wrong ? It doesn’t sound like you did anything wrong. Keep stirring? Is your honey super cold and a bit hard? Maybe run it under hot water to heat SLIGHTLY. Try making a small batch, like a tablespoons worth, so see if you get better results. Is there a difference in preparation when using creamed honey as the base?